Does Your Setting Have an Arc? Writers know that the main character’s change follows an arc. The plot has an arc of increasing tension toward the climax and then some resolution. How can a setting have an arc? Setting details are important, not lengthy chunks of detail, but enough interspersed so the reader has an image. The image also is relatable to the reader’s experience of being in a place like that or being reminded of a similar setting from movies or pictures. 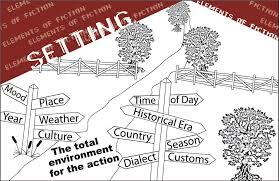 Setting becomes a character through the details and the emotions attached to them by the character’s past and present experience with it. As the character changes, show some corresponding differences in the environment. Perhaps there are real physical changes that occur, but it is the character’s new perception of it that is most important. For example, in Norman in the Painting, Jill’s hometown is a place of security. It’s a small county seat with attorneys and jurors rushing to the restaurants on Main Street during lunch. Tourists peruse the antique stores looking for bargains. The locals know her and the family name. Her parents spent their lives engaged in the town politics. The environment is safe for Jill. The reader sees the stores, court buildings, the alleyway to the parking lot, the cemetery, and Jill’s home as well as the contrast with her sister’s house. She enjoys the dark clouds and winter rain and jumps over puddles by the curbs. However, as Jill becomes less dependent on that familiarity, she smells the mold in the antique stores, she feels the attorneys’ stress and hears the jurors’ complaints about missed work. She is annoyed by the overflowing of the creek from the storms’ deluge of water and the sandbags in front of every store on Main Street that she has to dodge. After thirty-two years in the same place and never traveling, she’s ready for a change. The present setting has become oppressive. It’s a living, aging, grumpy environment needing an uplift. Jill wants to leave. Creating setting as a character in a story is another way to deepen the reader’s enjoyment of your work. What does the setting of your story mean to the protagonist in it? I never thought of setting having an arc, but you’re right. I think of Cormac McCarthy, the master of settings (and dialog, of course) and how the settings, alter as the characters’ situations and perceptions change. Well done, girlfriend. One more thing to think about when writing — yikes!!! Thanks, Ann. In Norman in the Painting, the setting arc goes down instead of up. A cute little town turns musty.